The government made the Queen say “northern powerhouse” in her speech but, having decided one silly phrase was enough, stopped short of making her say “£12 billion welfare cuts”. Even so, the commitment to reform and cap social security was confirmed. One way of looking at this is to say that this is incredible, that the Coalition gave up on a smaller scale of cuts in 2012, and it simply is not going to happen. The IFS repeatedly hint that this is their view and Flip Chart Rick has blogged about “12 billion flying pigs”. I don’t know if I agree with them. I certainly hope they’re right, but consider the damage failing to carry out these cuts would do to their case for austerity. The Chancellor has been talking £12 billion for two years now, it was in the Budget mood-music, not to mention the manifesto and the press will be hard on the government if they don’t deliver. He’s right. It would be very embarrassing, having banged on about it for so long, for the Chancellor not to deliver the cuts. His boss has been making things difficult for him though. The Prime Minister promised to protect pensions and pensioner benefits, which accounts for around half of the welfare bill. 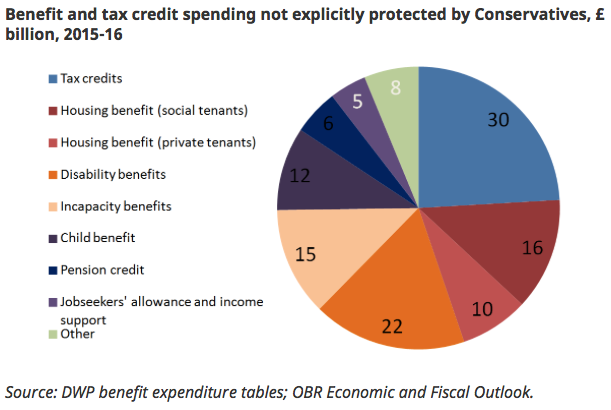 Last week, the IFS produced this pie chart showing what’s left. Oh but hang on, when put on the spot by angry parents before the election, David Cameron promised to ring-fence child benefit too. Because of the protections outlined above, about 80% of entitlements to the benefits in the chart go to working-age families; and because the large majority of working-age benefits spending is means-tested, it would be very difficult to avoid hitting low-income households. The assumption behind the rhetoric of tough welfare cuts is that there is a pool of unemployed who, if they could only be nudged and cajoled a bit, would go back to work. Cutting benefits is part of that nudge. The trouble with this argument is that employment, as the government keeps telling us, is now at a near record level. If ever there were any feckless unemployed, most of them have now gone back to work. Unemployment benefits account for a small and shrinking proportion of social security costs. It is unlikely that cutting benefits will incentivise the working poor to look for better pay or more hours. Most of them will be doing that anyway. For some idea of the impact £12 billion of cuts might have, take a look at these three charts. The first, from last week’s OECD report on inequality, shows the extent to which the UK’s benefit system reduces poverty among households dependent on non-standard work (NSW), meaning that which is anything other than permanent and over 30 hours a week. The UK shows a 60 percent reduction on poverty for non-standard worker households, second only to Ireland. The second chart comes from a report by the Institute for Social & Economic Research for the Child Poverty Action Group. This shows that, but for redistribution through taxes and benefits, the UK would have one of the highest child poverty rates in Europe. Thanks to the benefits system, child poverty comes down from 40 percent to 15 percent, putting it below the EU average. 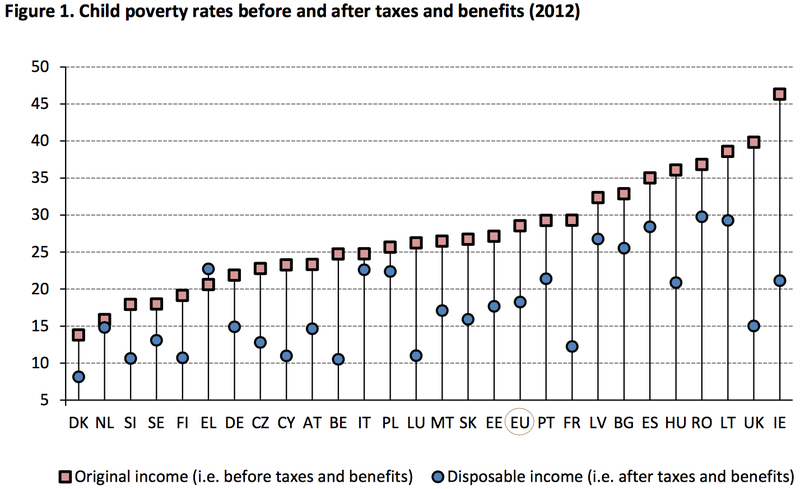 The UK’s welfare system, then, takes its poor from well above to just below EU and OECD poverty rates. Or, to put it another way, if the government starts reducing benefits, this country will shoot up the international poverty league tables. As the OECD says, the UK’s benefit policies are especially helpful to non-standard workers, such as those on part-time, temporary and zero hours contracts. The impact of reducing these benefits would be severe. The third chart comes from a paper on poverty and inequality by LSE’s John Hills. 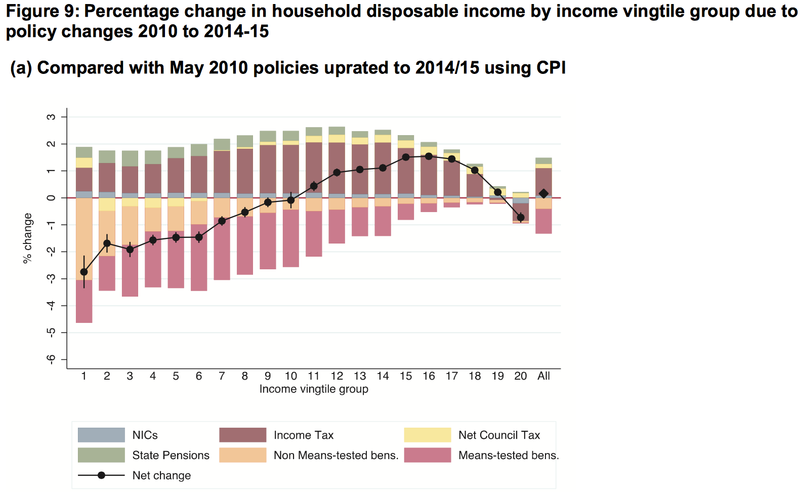 He shows how the changes to income due to tax and benefit changes since 2010 affected people across the income distribution. Overall, the poorest twentieth lost nearly 3 per cent of their incomes (before allowing for indirect taxes) and the next five-twentieths approaching 2 per cent. But, with the exception of the top twentieth, the income groups in the top half of the distribution were net gainers on average. From the bottom to four-fifths of the way up, the changes were clearly regressive, hitting those lower down hardest as a share of their incomes. This is because benefit reductions were greater for the bottom half than their gains from lower Income Tax. This fall in income came about as a result of welfare cuts that, as the IFS said, were relatively modest and which fell well sort of their target. What, then, would be the effect of a further £12 billion cut? [A]n internal government assessment, seen by the Guardian, shows that if parents are unable to find extra work the policy will put 40,000 more children on or below the official poverty line, on top of the 50,000 already affected under the current rate. The leak has emerged as housing associations forecast that, under the lower cap level, they will have to deal with a dramatic spike in rent arrears, evictions and homelessness, and will no longer be able to offer homes to jobless low-income families. Modelling by the National Housing Federation (NHF) indicates that on top of the 59,000 households already affected, a further 90,000 households across private and social sectors in England will have their income reduced by the new cap. Detailed calculations by two housing associations, Moat and Sovereign, show that the lower cap level will make all three-bed affordable rented homes and some two-bed homes instantly unaffordable to capped tenants in a corridor stretching through Tory heartlands from Thanet and Basildon to Reading and Winchester. The government says they are exaggerating but even if you halve these figures, the implications are frightening. These calculations are based on £2 billion of cuts*, around one sixth of what the government says is still to come. I don’t believe David Cameron and George Osborne want to see scenes like this. As I said before the election, they are not ideologically driven state-shrinkers. The Prime Minister, in particular, tends to roll over whenever he is confronted by angry Middle-England, whether it’s over child benefit, trees or flood defences. Some of this has been blamed on the Liberal Democrats’ influence over the last government but I’m not so sure. I don’t think Dave likes aggro, especially not the sort he’d get from the widespread social distress that dismantling in-work benefits would entail. Bear in mind too that, at the same time as the welfare cuts, there will be a lot of other divisive stuff going on. Public spending cuts will be at their most severe in 2016-17, there will be an EU referendum, trade union legislation and the repeal or replacement of the Human Rights Act. All these things will increase the aggro factor. Richard may be right. Perhaps the government will push through £12 billion of benefit cuts. I doubt it though. I still reckon they are hoping the economy will do the heavy lifting for them. A good spurt of productivity growth and wage increases could solve the problem. As Adam Corlett said, if productivity grew in line with the OBR’s more optimistic projection, the government could eliminate the deficit without needing any spending cuts at all. Given the government’s other constraints, the only way to shrink the welfare bill by £12 billion is to reduce the amount spent on benefits to people in work. The only way for that to happen without considerable distress and social unrest is for a lot more people to start earning a lot more money. A pay rise is still the most effective way of taking working people out of welfare dependency. Unfortunately, last week’s GDP figures confirmed the slowdown in economic growth, productivity is still flat and pay growth is sluggish. In its latest inflation report, the Bank of England cut its forecast for wage growth. Wages will almost certainly rise over the next three years. The question is, will they do so quickly enough to reduce welfare costs and spare the Chancellor’s blushes? Update 1: Declan Gaffney has a detailed explanation of what happened to social security under the Coalition. In short, the government hammered claimants yet still ended up with welfare costs not that much lower than those planned by the Labour government’s last budget. This chart shows where the main budget overruns occurred. The major benefits that were lower than forecast by the end of the parliament were Jobseekers’ Allowance and Attendance Allowance. The others all came in higher. Higher than forecast expenditure on housing benefit and tax credits is explained by economic factors – most importantly, an unprecedented stagnation of nominal wages. Given that housing costs are still rising and wages are only just starting to unstagnate, the chances of the £12 billion target being outrun by reality again look pretty high. Update 2: Jonathan Portes reckons the benefit cap won’t even save £2 billion. Update 3: *Clarification – The £2bn isn’t just the amount saved by the welfare cap. It’s the amount saved by all the measures announced so far. Update 4: Some people have asked why the cost of incapacity benefits is so high. As Jonathan Portes explains, the government tried to reduce this but somehow ended up increasing it. Update 5: David Cameron has confirmed that there will be no cuts to child benefit. Update 6: Picking up on Michael O’Connor’s comment here, John Rentoul wonders if welfare cuts might yet be achievable. So much unprotected welfare spending goes to families on above median incomes that it would be theoretically possible to cut £12bn and to leave the distribution of income more equal than before. London is a city where even people earning above the national median wage rely on in-work benefits. 15 Responses to Is a £12bn welfare cut achievable? Only with a big pay rise! How about a further combination element – welfare reform leading to administrative cost reductions? Running costs at the DWP were £7.8Bn in 2011/12 – reform to a negative income tax system or localisation could see the DWP reduced in size dramatically as other institutions take over. A negative income tax would require much the same assessments as now (income, family composition, earnings, disablement related needs, caring responsibilities, housing costs), unless you were prepared to have very large numbers of losers, or to massively increase the cost of social security in a poorly targetted fashion. Possibly. But NIT can be made to dispense with many of the assessments. For example, an additional personal allowance could be awarded to a parent for each dependent child under 18. That would dispense with Child Tax Credit and Child Benefit. Earnings and other income is automatically catered for with NIT so there s no need for complex assessments for these items as this would all be done automatically via HMRC’s Real Time Information system, which is now in place (unlike Universal Credit). NIT is a way of dispensing with Working Tax Credits and their silly qualifying criteria. . Disability is the one area where assessments would need to continue, particularly as there are grades of disability, which require targeted responses. Again, disability can be accommodated for under NIT by awarding additional personal allowances according to the level of disability. The quantum of personal allowance is what would be subject to assessment but once decided, payment would be automatic under NIT. However, when all said is done, it seems likely that payment of a substantial unconditional Basic Income would work better than NIT. Basic Income could be paid for in part by abolition of the personal allowance, an approach which contrasts sharply with NIT, which depends on the continued existence of the personal allowance to calculate payments due to individuals. Housing costs and Council Tax would need to be incorporated into the size of payments under both NIT and Basic Income proposals. Policies to reduce housing costs and Council Tax for individuals with low market incomes would probably need to be implemented in tandem with either NIT or Basic Income. Increased house building and the method of calculating annual property tax are both on the agenda in this context. But sadly governments like our economy to be addicted to debt and everlasting asset prices (no matter what wages do or the % tenants who is pushed to side). 1. stop the MoD spending on disastrous “custom” projects, like Chinooks without their software (we were going to write our own, to “save money”). They’ve never flown. Ditto the ill-fated Nimrod stuff. Just buy the American kit – cheaper, proven and interchangeable on the battlefield. 2. close Faslane (would please the SNP) and get the Americans to maintain Trident subs for us. Buy US Trident subs – pointless building our own. 2. get the NHS to behave like the monopoly it is. Tell nursing agencies what you’ll pay and stick to it. Stop whining about this – a state monopoly should be able to plan the training and retention of nurses at minimal cost. The fact it can’t means lots of those management consulting types on six-figure salaries need to be fired, now. There’s a few billion saved to start the week. The ideology of the cabinet is irrelevant. The costs that should be cut are in the area of housing. make housing affordable and the bills fall for all. Impoverishing poor people is a cruel and irrational policy choice. All the States policies raise housing costs and reduce supply. This is Thatcher redux from 1979 -83. With a clueless Opposition chuntering along. sadly they wont do so. They think that high house prices is a benefit for all since i suspect that is what their circle is (homeowners). They dont have a clue what is happening to working PRS tenants families all around the country. The death of aspiration. Can we have some joined up thinking here? “Welfare Reform” ie introduction of PIP & Universal Credit is estimated to cost £12.8 billion in extra admin costs alone, yet the government thinks it will save £12 billion. Have they been sniffing Tippex? Is there that much Tippex? The £12.8 Billion relates to universal credit only, and was an estimate of the combined cost of developing the scheme and running it for 10 years – much less than the cost of administering the multiple benefits and tax credits it’s intended to replace. Unfortunately, I’m pretty sure firstly that they have already accounted for the hoped for administrative savings and secondly that any such savings are vanishingly unlikely to be achieved on anything l ike the original timescale. Or rent controls. That would save a fair amount of housing benefit. I can’t remember where I saw it but it would cut the bill in about half. Rent controls and minimum wage rises needed.